These days there are more possibilities for ‘the TV’ than just being a box in the corner of the room. It makes sense to install an integrated system, where the screen is at the hub of work and entertainment activities. Although this concept was first proposed several years ago it is only now gradually becoming economically and technically possible. Of course this does require more commitment, work and knowledge to set up than a simple TV. One thing definitely to bear in mind is that standards and features for digital audio and video are still changing so fast that it is difficult to make equipment choices that provide future proofing. In this article we will take a look at component choices and how to best hook them together. A home Audio/Visual system can be quite complex so it’s best to plan in advance before purchasing any components. You will need to decide on what you require your home system to do and on how the available space and budget may restrict your choices. It may seem attractive to integrate equipment you already own, but because of the new features required by digital audio, digital video and HD video this may not be practical. Moreover, you should buy your audio video components from the best audio visual company to be sure of quality of the components. A system may be composed of the following components: a display, a media player and/or a gaming console, a set top box, an audio amplifier, loudspeakers (from two to eight), a hard disk or DVD recorder, a PC and remote controls, plus possibly an aerial, cable feed or satellite dish. You might also want to include a tuner for radio reception. For displays there is a choice to be made between a computer monitor, a television or a projector. Computer LCD monitors are available with up to a 50-inch diagonal screen size although these are expensive at nearly Rs. 3 lakh. However, you can, for example, get a ViewSonic 22-inch with an HDMI connector and HDCP support for around Rs. 15,000. The advantages of computer monitors are that in the smaller sizes they are relatively cheap and provide high resolutions. They are best suited to their primary purpose as computer displays with a secondary use as entertainment displays. However, for use in a home A/V center it is important to buy a monitor with an HDMI input and HDCP support. There are still many new computer monitors for sale that do not have these features. TVs have the advantage that they can be used stand-alone, are available with up to a 52-inch diagonal display and the current flat panel TVs usually have quite a range of input and output connectors. Again an HDMI input and HDCP support is essential; many of the earlier high resolution flat panel TVs do not have these features. The big advantages of projectors are that they can be installed unobtrusively, they don’t take up much space and they can provide large displays. Unfortunately, there are quite a few disadvantages: projectors are relatively expensive, particularly for higher resolutions and the running costs due to power consumption (350W for a 1200 lumen projector) and the cost of replacement lamps, are high. You can expect to pay between Rs. 60,000 to Rs. 130,000 for a 1920x1080 resolution. Replacement lamps can cost Rs. 18,000 to Rs. 25,000 and you should budget for at least one lamp change during the life of a projector. 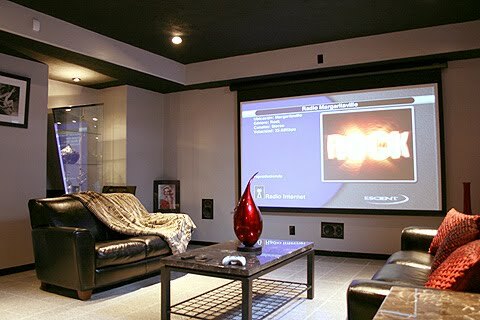 Ceiling mounting a projector can also be something of a chore. Let’s avoid all the audiophile arguments about audio quality – frequency response, distortion and so on – and assume that an amplifier bought from a well-known brand name manufacturer is going to be of a good enough quality and we’ll concentrate on the required features. The first thing to decide on is whether you might be satisfied with two channel stereo sound, or want to go for a surround set-up (with 5.1 or even 7.1). Most surround sound capable amplifiers have built-in decoding for both Dolby and DTS systems; best to avoid any that don’t. Modern loudspeakers are usually quite inefficient (efficiency is sacrificed in favor of flat frequency response). Many multichannel amplifiers claim 100 or 200 W per channel although they don’t specify exactly what is meant by this. 50 W r.m.s per channel will be more than enough in most domestic settings. Remote control of volume and input selection are desirable features, but it’s unlikely you will find a mainstream audio amplifier that doesn’t have these. Choose an amplifier with at least two HDMI inputs and two HDMI outputs; most amplifiers with these will also have a selection of phono connectors for other audio inputs and may also have digital optical inputs and outputs. Although you can use the amplifiers and loudspeakers built in to a computer display or a television, these are normally limited to left and right stereo, are usually small and of limited quality. An external amplifier can drive multiple loudspeakers for a surround sound setup. With stereo sound where two loudspeakers are placed one to the left and one to the right in front of the listener, the illusion of a sound coming from any point between the two loudspeakers can be generated by driving both loudspeakers with the same signal, but at different volumes. When the volumes are equal the sound source appears to be in the center, if the left portion of the signal is louder the sound source appears to move to the left, if the right signal is louder the source appears to move to the right. In surround sound this principle is extended by adding more loudspeakers placed around the listening position and the greater the number of loudspeakers used the more accurate is the illusion. Movie theatre installations have used as many as 24 loudspeakers. Home installations normally use five small ‘satellite’ loudspeakers plus one bass-reflex sub-woofer and are referred to as 5.1 (five smaller loudspeakers plus the single bass woofer). This arrangement is based on the principle that the sense of direction of a sound diminishes as frequency falls, so the bass frequencies can be provided by a single loudspeaker (note the difference between this and the movie theatre use of the sub-woofer only for extreme low frequency effects). Conveniently, it’s the bass frequencies that require the largest, most powerful loudspeaker, while the middle to upper frequencies require less power and can be generated by much smaller loudspeakers. The two front loudspeakers provide the left and right sound stage for sounds in front of the head, while the two rear loudspeakers expand the sound stage behind the head and in combination with the front loudspeakers, to the sides. A central loudspeaker located behind or just above the middle of the screen is used to reinforce the center of the sound image for dialogue of characters in close- up. A 7.1 system extends the 5.1 layout by adding two further loudspeakers – back left and back right. 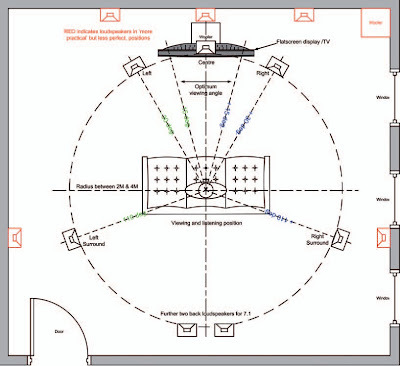 In 6.1 there is only a single center back loudspeaker. However, in most domestic situations setting up even a 5.1 system can be tricky. Placing the two rear speakers presents the greatest difficulty because the ideal position for these is just a little behind and above the listener, effectively placing them on stands in the middle of the room. For a stable and accurate surround image it is important that the loudspeakers in a surround sound system are all from a matched set. It is inadvisable to try to build up a surround system by adding loudspeakers to an existing left/right stereo pair unless they are identical models. A 5.1 system requires quite a lot of space, very symmetrical rooms should be avoided and hard reflective surfaces – the ceiling above and the floor in front of the listening position – should be damped. Floor reflections can be controlled using carpets while ceilings can be fitted with acoustic panels. It may also be desirable to fit acoustic damping to the wall behind the listening position. While the single bass loudspeaker can be placed almost anywhere in the room, some positions will sound better than others and finding the right position is a matter of trial and error. Perhaps the ideal position is mid-way between the two front loudspeakers just below the screen. It is important to balance the relative levels between the small satellite loudspeakers and the sub-woofer and 5.1 systems usually have a separate gain control for the sub-woofer. Placing loudspeakers at junctions between walls and floor or ceiling will boost bass, although this may not be an issue with small satellite speakers. Putting the sub-woofer in a corner may seem convenient, but it will result in a large bass boost and it may not be possible to balance the bass content using the bass gain control. Smaller 5.1 systems, particularly those designed for computer gaming, may have a five channel amplifier incorporated into the bass sub-woofer cabinet, eliminating the need for a separate amplifier. These can be reasonably effective in smaller rooms. At the other end of the scale, very high-end systems may also use wide frequency range active loudspeakers with larger cabinets. Sub-woofers may not be needed with such systems. Program sources – aerial, cable or satellite? Standard definition analogue television broadcasts are gradually giving way to DVB-T (Digital Video Broadcasts – Terrestrial) and existing televisions can be converted for digital reception with the addition of a digital tuner, often in a set top box. Even in major population centers reception of the digital terrestrial broadcast signals can be poor, the digital broadcasts do need a different aerial to that used for the analogue signals and you may need a high gain, very directional ‘digital’ aerial, possibly even fitted with a signal boosting amplifier. Using an aerial allows access to the ‘free’ broadcast digital channels. However it may be more convenient to subscribe to a satellite or cable service using a set top box, which should guarantee a strong signal. Even with a satellite or cable service it’s not guaranteed that program reception won’t be interrupted from time to time. Satellite reception is perhaps slightly more likely to drop the signal than a cable hookup, depending on the weather, the condition of the satellite network and sunspot activity. HDTV is just starting to become available in India this year. Many program makers are changing to HD and Direct to Home (DTH) satellite packages are available from Dish TV, Reliance Communications BIG TV, Tata Sky, Sundirect DTH, Airtel Digital TV and the public sector DD Direct (Doordarshan). HD set top boxes from Dish TV cost between Rs. 3,300 and Rs. 4,000, around twice the price of standard definition. Cable services are also extremely popular in India and since a furore in 2001 over large price hikes, have been provided on a Conditional Access System (CAS). CAS allows consumers to choose and only pay for those channels they want to watch. Apparently the government’s decision that the 2010 Commonwealth Games will be broadcast only in high-definition has galvanized the push toward HDTV in India. As a result, the state-owned broadcaster Doordarshan, which is expected to launch HD-TV on an experimental basis soon, has stated it will produce content for the Commonwealth Games in this format. Although most flat panel TVs and media players and audio amplifiers still sport an array of different connectors for interfacing with other equipment, the High-Definition Multimedia Interface (HDMI) which started appearing on products in 2003, has become the default for hooking together digital audio and video equipment. One of its design aims was to minimize the tangle of wires connecting the various units of an AV system together by combining video, audio and control cables into a single cable with just one connector on either end. In this way cable clutter is minimized and the various units in a system can be chained together with just a single cable running between each one. The high end audio market is notorious for taking things to extremes in the supposed pursuit of ever better sound reproduction. Exotic materials, specialist construction techniques and bizarre theories are regularly extolled as providing better sound, much of the time merely as an excuse for charging huge sums of money. Audio cables are a particular subject of controversy in this respect, even though these are only required to carry relatively low frequencies up to 20 KHz or so and it should not be particularly challenging to engineer a cable to carry these low frequencies over short distances. HDMI is based on and is backwards compatible with, DVI-D and DVI-I and HDMI cables and signals can be connected to DVI devices using an adaptor. However not all of the HDMI functionality will be supported. The HDMI specification is currently up to version 1.3 which adds support to the preceding 1.2 specification. Unfortunately, a number of current Blu-ray players, amplifiers and so on only have support for 1.2. To confuse things further, some features of the different specification revisions are optional features. For example, 1.3 adds optional support for output of Dolby TrueHD and DTS-HD Master Audio streams for external decoding. TrueHD and DTS-HD are lossless audio codec formats used on Blu-ray Discs. There are two main HDTV image formats in common use: 1080i and 720p. These numbers refer to vertical resolution; the number of lines in the image from top to bottom. For an image with a 16:9 aspect ratio this means a 1080i image is 1920 by 1080 pixels and a 720p image is 1280 by 720. So the 1080i format would seem to have higher resolution. Obviously for a display to be able to present 1080i or 720p signals its physical resolution must at a minimum match that of these signals. Looking at the specifications for HD Ready TVs can be a little confusing; for example, you can buy a 19-inch HD ready TV with a screen resolution of 1440 by 900. HD Ready TVs use powerful image scaling algorithms and hardware to obtain the best fit for the variety of signal formats they must display. Because it was too expensive to design the early analogue TVs with a stable picture size that exactly filled the screen, the old TV signal standards allow for over scan; a border around the edge of the image that does not contain any important scene elements, such as title text. Analogue TVs are set up so that most of this over scan area overlaps past the edges of the physical display area. Digital TVs do not need to over scan since they can map images precisely to all the available pixels, but nevertheless they may allow some over scan in an attempt to provide the best display for signals using the earlier formats. Raw video recording requires huge amounts of storage capacity. Because of this, all digital video is heavily compressed. Depending on the application, different compression schemes are used. For example, movies encoded to DVD use MPEG-2 (Motion Picture Experts Group 2) while HDTV uses H.264. H.264 is equivalent to MPEG-4 AVC (Advanced Video Coding). If you want to display HDTV on your computer you will need a graphics card that includes H.264 decoding. NVidia include this capability in a suite of features it calls PureVideo, so any of its graphics card products that support PureVideo are suitable for HDTV display. ATI has a similar suite of HD features it calls Avivo. Although these sophisticated compression algorithms solve the huge size and bandwidth problems of raw high resolution digital video, they do at times introduce visible artifacts, most often seen as blocky patches in the image. When the specifications for high definition video and Blu-ray were being drafted the major content providers such as Time Warner and Sony, concerned about the degree of piracy with the old analogue formats, insisted that all high definition video hardware should incorporate some form of content protection. HDCP uses a public key, private key encryption system to exchange handshakes between every device in the reproduction chain. If the handshake fails then the encrypted signal is not passed across the link. Public keys may be placed on a revocation list that is included on new media. If during the handshake, a public key is exchanged that is found to be on the revocation list, the device supplying the key is no longer recognized. Some critics of HDCP have said that reverse pressures from the hardware manufacturers, concerned that implementing HDCP encryption would add too much to the manufacturing costs, have resulted in a weak encryption system that is relatively easy to break. It is possible to buy HDCP dongles or strippers on the ‘grey market’ that can be inserted in the signal path to, for example, convert a non-HDCP compliant monitor. However, because these devices break the integrity of the encrypted signal chain, they are subject to key revocation. Viewing Distance and Screen Size Our eyes have sharp focus in the center of the field of view surrounded by our peripheral vision. This means that there is a cone of vision or field of view where objects will be seen most clearly. As a result, for a given screen size there is an optimum viewing distance. Since vision varies somewhat, the viewing angle used by different organizations to calculate the optimum viewing distance also varies. SMPTE (Society of Motion Picture and Television Engineers) recommends a 30 degree viewing angle, THX (Tomlinson Holman’s eXperiment – see boxout) 36 degrees (preferred) to 26 degrees. The simplest way to work out the ideal viewing distance is to consider that given the SMPTE recommended viewing angle the distance to the screen should be 1.9 times the screen width (taking the THX recommendations the distance to the screen should be between 2.2 and 1.54 the screen width). 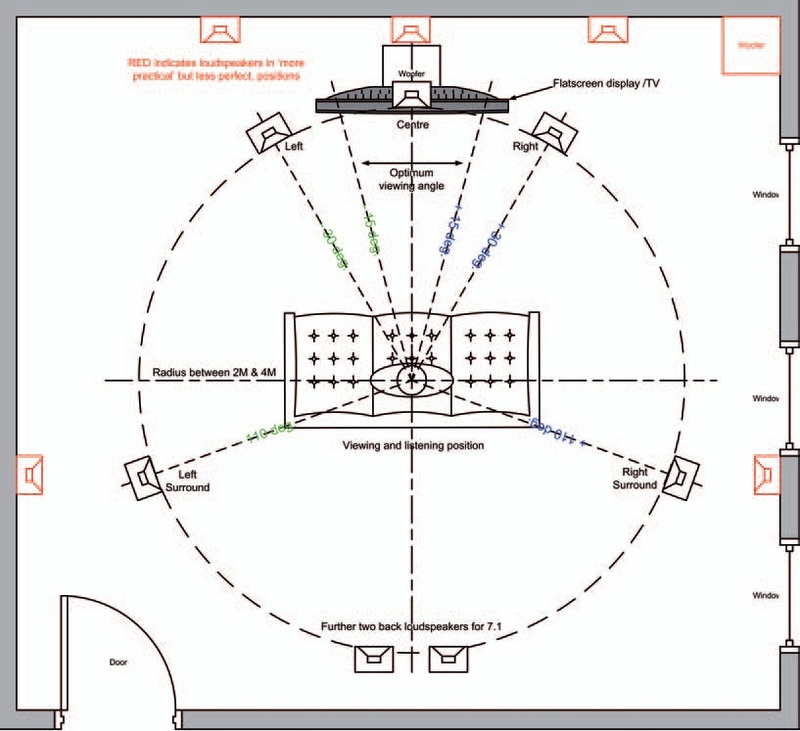 Given the Dolby recommendations for a 5.1 speaker set-up radius of between 2 and 4 meters, this means that a 40-inch (roughly 1m) screen is not too large even at a 2m viewing distance. At 4 meters a 2m plus screen can be accommodated. HD images will of course tolerate closer viewing before the individual image elements become visible than will standard definition images. For un-edited playback you can plug these cameras directly into your display, normally using composite or RGB outputs and inputs, and using the camera itself as the playback device. Editing of HD can be done by capturing the video onto hard disk and using editing software such as Adobe Premiere on a Windows PC or Final Cut Pro on an Apple. The latest versions of these programs support HD editing.